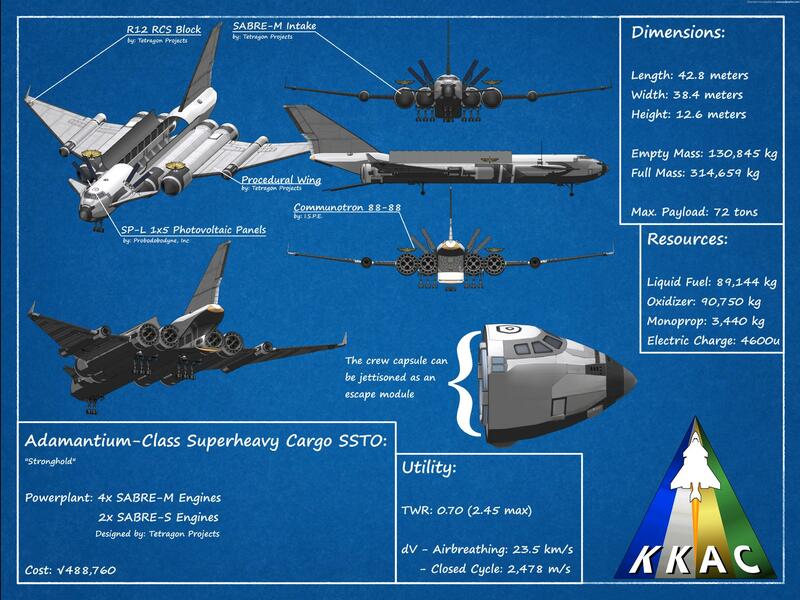 KerbalX - Adamantium-Class Superheavy Cargo Transport SSTO: "Stronghold"
Adamantium-Class Superheavy Cargo Transport SSTO: "Stronghold"
A mod aircraft called Adamantium-Class Superheavy Cargo Transport SSTO: Stronghold . Built with 230 of the finest parts, its root part is B9.Aero.HL.Body.Cargo.C. It’s unwieldy. It’s slow. SAS doesn’t like it. KNN referred to it as a Flying Stronghold , and Jeb called it boring , the death knell for many craft, not just those under the KKAC banner. BUT! For situations where you absolutely have to bring THE biggest loads into space, the Stronghold is the space plane for you. At forty-two meters from fore to aft, and weighing in at three-hundred fourteen tons when fully fueled, the Stronghold is even larger than the Skyvan–with an appropriately inflated price tag; √489,000. Many redundant systems, such as backup solar panels, ensure your crew can survive any length of time in space, and an SRB-powered abort mode will ensure your crew survives until the end of the mission, even if the craft does not. Get yours today! 1) The Stronghold is slow. Really slow. Make sure to use the max length of runway possible on takeoff, but be careful on initial ascent–the number of joints means that even with struts the craft will get wobbles, mainly flapping like a condor if your AoA gets too high. 2) Use the rocket mode on the SABRE-S engines sparingly to ensure your horizontal and vertical speed both stay on a slow and steady climb. 3) Stability will become an issue as you pass through max -q- in atmo–the craft will want to gain positive pitch that SAS isn’t always sufficient to correct. Fortunately , your frame rate should be low enough you can correct for it manually. 4) Orbit circularization should be performed as normal for an SSTO–gain as much horizontal speed in-atmo as you can before switching over to closed-cycle mode. The fuel reserves should safely give you a fully-loaded (with payload) service ceiling of a 130,000m orbit.